A little more than three months after releasing one of the best albums of their 17-year career, The Roots are back, this time with John Legend. The pairing is inspired. The Roots have long have a reputation as the best band in hip hop. For the past couple years they’ve proved their mettle to the mainstream as the house band on “Late Night with Jimmy Fallon.” Legend is clearly a great talent, but often gets overwhelmed by slick production and light-weight songwriting. These 10 reinterpretations of classic soul protest songs offer the perfect platform for him to shine. Legend lives up to the opportunity, singing with grit and emotion only hinted at on his solo albums, and feeding off the Roots’ vibe. Opening cut “Hard Times,” a lost Curtis Mayfield classic written for Baby Huey, feeds off a horn line ricocheting off of Ahmir “?uestlove” Thompson’s drums and Captain Kirk Douglas’ bright guitar. Black Thought’s rap in the middle reinforces the track’s message and feel. This is music to spark both revolution and revelry. 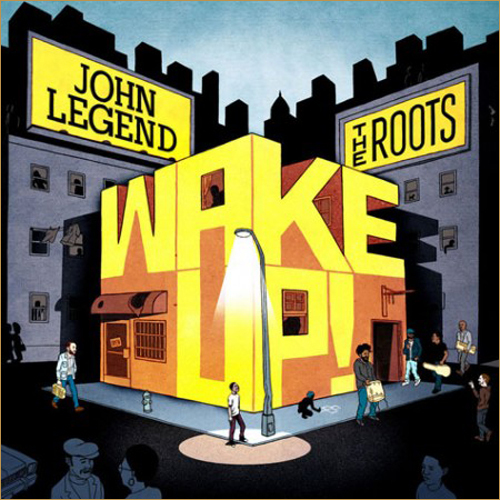 “Wake Up Everybody” features a guest rhyme from Common that feels like a verse from a lost hymn. Legend’s duet with Melanie Fiona here captures the same mood as a classic Marvin Gaye/Tammi Terrell number. “Little Ghetto Boy” – bolstered by another Black Thought cameo – and the buoyant gospel reading of Nina Simone’s “I Wish I Knew How It Would Feel to be Free” are other high points. Unfortunately, the album can’t sustain these moments. Legend’s vocal shortcomings come to the foreground on “Wholy Holy.”Gaye’s voice soars effortlessly on the original, while Legend strains just to lift off. His over-singing on Bill Wither’s “I Can’t Write Left-Handed” is accidentally exposed by Douglas’ understated, tasteful soloing. Not all of the blame lies at Legend’s feet. Normally an impeccable arranger, there are some surprising issues with Thompson’s choices. Les McCann’s “Compared to What” swings and skips like a rock skimming the top of a lake. Thompson’s slower arrangement is leaden in comparison. His treatment of Lincoln Thompson’s (no relation) reggae song “Humanity (Love the Way it Should Be)” hews closely to the original, but without the Jamaican patois it seems stiff and forced. The performance should have been reworked to emphasize what Legend could bring to the number. “Wake Up” was inspired by Barack Obama’s 2008 presidential victory and Arcade Fire’s song “Wake Up.” The original plan was record an EP, and truthfully Legend and the Roots should have stayed with that concept. The handful of strong cuts present would have made for an outstanding mid-player. As is, this is a solid album with plenty of outstanding moments, but ample opportunity to skip to the next cut. Or, better yet, seek out the originals. For the past 46 years, few have been able to see “ The T.A.M.I. Show,” the 1964 concert film that captured early performances from the Beach Boys, Marvin Gaye, Smokey Robinson and the Miracles and the first major U.S. appearance of the Rolling Stones. A tangle of legal issues sent the movie to exile almost immediately after it was sent to the theaters. The producer lost his rights and the film was never released on video rarely shown in public. For years fans would read about how incredible the “T.A.M.I. 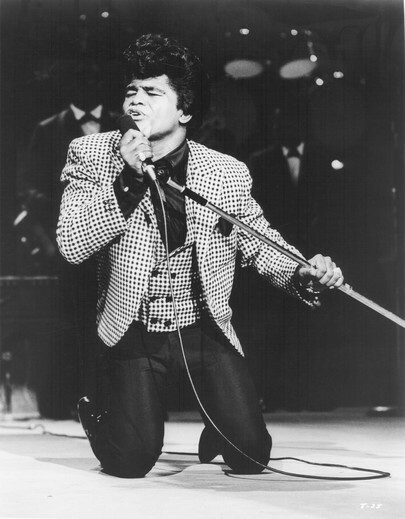 Show” was – particularly James Brown’s appearance, which Rick Rubin once said “may be the single greatest rock and roll performance ever captured on film” – without being able to see it. Thankfully this has finally been corrected. After decades of wrangling, Shout Factory has finally released the “T.A.M.I. Show” on DVD. After a montage of all the stars arriving over one of the longest Jan and Dean songs ever, Chuck Berry takes the stage. His appearance ties the film back to “Rock Rock Rock” and the classic ‘50s rock and roll films, but halfway through “Maybelline,” the camera swings over to Gerry and the Pacemakers doing their version of the song. It’s a little disorienting at first, and doesn’t completely work, mostly because Gerry is so campy. He’s constantly playing to the camera, and the group clearly doesn’t have Berry’s talent or charisma. Fortunately, an endless parade of go-go dancers in bikinis is on hand to distract from any lulls in the music. Constantly in motion, the dancers swarm across the stage – often directly in front of the performers – and on platforms in the back. The producers discovered what MTV perfected in the ‘90s with “The Grind:” buxom, gyrating dancers will make even the most execrable music enjoyable. The showgirls hog the camera during the first number of Smokey Robinson and the Miracles’ set. Fortunately, lens eventually pulls back on the second number, and the quartet delivers the first great performance of the night. Robinson drops down, jumps up and throws his entire spirit into an extended “You Really Got A Hold On Me.” That energy carries into “Mickey’s Monkey,” that has everyone onstage and in the crowd dancing. Marvin Gaye continues Motown’s strong showing with a great “Stubborn Kind of Fellow.” For “Can I Get a Witness” he performs away from the band, flanked by two shimmying girls. Director Steve Binder isn’t shy about cutting to the junior high and high school students in the audience screaming in delirium. One long shot accidentally allows a glimpse of policemen in helmets patrolling the aisles. There was clearly a hard line on the level of excitement that could be displayed. It’s hard to believe Lesley Gore was the biggest star on the bill at the time, and that she didn’t become an even bigger star later. Gore dutifully performs her best-known songs, the No. 1 “It’s My Party” and its Top 5 sequel “Judy’s Turn to Cry,” but her poise, grace and presence suggest she should have had a much longer career. Gore It’s too bad she couldn’t keep up with the harder, psychedelic edge rock music was about to take. Several of Gore’s songs are captured by a camera that looks like Vaseline has been smeared over the lens. In the commentary track, Binder said that was exactly what was done. He either couldn’t afford or didn’t have time to outfit the rigs with soft focus capability, so they went with this bargain basement substitute. Unfortunately, it looks like Gore is singing through a funhouse mirror. Jan and Dean, the evening’s MCs, kick off the surf portion of the show, but they are outmatched by the Beach Boys, who follow. Jan and Dean’s harmonies seem thin and the skate-board-in-a-guitar-case trick can’t hold up to the Boys’ rich voices and Brian Wilson’s songwriting. The performance was filmed months before Wilson’s nervous breakdown forced him off the road. Here he looks completely at ease and happy. The film treads water through the Dakotas, Supremes and Barbarians until – finally – we get to James Brown and the Famous Flames. Honestly, there’s nothing he does here that wasn’t captured on the incredible “Live at the Apollo” album one year earlier. This, however, was his first major show in front of a white audience. It also gave fans the opportunity to see Brown work his magic in addition to just hearing it. The Flames are razor-sharp as Brown kicks into “Out of Sight.” Showing his penchant for adventurous covers, Brown resuscitates Perry Como’s hit “Prisoner of Love.” He then directs the Flames into “Please, Please, Please” and the place goes nuts for the now-infamous cape routine. Brown’s pants, which were clean before the song, are scuffed and dirty at the knees from all the times he falls down (only to pop right back again.) During “Night Train” he does this crazy dance on one foot where he manages to wriggle across the stage. Not only does he not fall down, but he looks impossibly smooth. It’s difficult to watch the early Stones without picturing the lazy spectacle they’ve become. There is a hunger in these songs and Mick Jagger is genuinely working to win the crowd’s approval. It’s odd to see Brain Jones so alive and so happy. It seems he was born with those omnipresent bags under his eyes that just grew sadder and deeper until the lids above closed forever. But that was still several dark years off. The “T.A.M.I. Show” is a celebration that despite some dated production techniques and material still feels vibrant. It’s a peek behind a curtain to a world where artists from not only all over the world, as the song goes, but all genres, could party together on the same stage. In a way, it was a precursor to the weekend festivals that would pop up at the end of the decade and have resurfaced to dominate the summer musical landscape again today. The Four Tops needed this. The departure of Holland-Dozier-Holland was a devastating blow to all of Motown, but the Tops felt it especially hard. “Bernadette” made them the top Motown act in U.K., second only to the Temptations at home. But just when they made it to the top, their songwriters and producers left. After the HDH exodus, the Tops dabbled on the fringes of psychedelic soul (“It’s All in the Game”), the folk revival (“If I Were A Carpenter”) and covered the Left Banke’s “Walk Away Renee” to solid, but not spectacular results. Singer Levi Stubbs opens the track drenched in echo, inviting the listener “Walk with me/Take my hand.” The arrangement has a distinctive Motown touch, filled with a great guitar hook, clavinet and an ornate percussion figure pushed to the front of the mix. As always, the Tops’ vocals are great, and while Stubbs isn’t given much room to cut loose, he still belts a couple notes before the chorus. 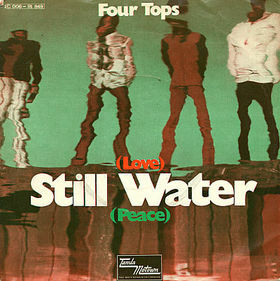 “Still Water (Love)” opened the Tops’ 1970 concept album “Still Waters Run Deep,” which inspired Marvin Gaye to compose “What’s Going On.” “Still Water (Love)” was covered by the Jean Terrell lineup of the Supremes in the early ‘70s, and soul singer O’Bryan. Four Tops – “Still Water (Love),” Pop # 11, R&B #4. This was the moment. For years, Berry Gordy had been grooming Diana Ross to become a star. First he pushed the hesitant child to the forefront of the Supremes, then elevated her to top billing. Now she was on her own. Ross’ first single, “Reach Out and Touch (Somebody’s Hand)” was a respectable Top 20 hit. For anyone else, it would have been a brilliant success. But at Motown, and especially for Ross, Top 20 was not good enough. She had to top the charts. For her follow-up effort, Gordy turned to Nick Ashford and Valerie Simpson, who also penned “Reach Out.” Instead of writing a new number, however, the pair reached back to a song that had been a Top 20 hit for Marvin Gaye and Tammi Terrell three years earlier. Their choice wasn’t well received. Ross was hesitant to cut a song that had already been a hit with someone else. Besides, she had also performed the song when the Supremes paired with the Temptations for a television special and album in 1968. Eventually, Ross was persuaded to record a re-imagined version of the song. While Gaye and Terrell’s arrangement build upon the synergy of their voices, the new vision opens with Ross’ affirmation of love, like a lonely, long-distance telephone call. The backing chorus of Ashford and Simpson, the Andantes and several other Motown studio singers builds slowly in the background underneath Ross’ promises of devotion. By waiting so long to grow into the refrain, the familiar strain is even more powerful. When the finished track was submitted to Gordy he was not pleased. He thought the song should open with the chorus (an arrangement Ross later used in her live shows). In a story that mirrors Gaye’s recording of “I Heard It Through the Grapevine,” it wasn’t until DJs started cutting down the six-minute album track and playing it on the radio that Gordy finally acquiesced. Just as before, “Mountain” made a major star out of its singer. 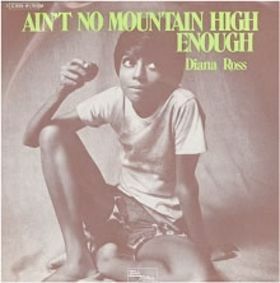 “Ain’t No Mountain High Enough” has been played, performed and sampled so often it sometimes feels like a cliché. It seems every time a director wants a feel-good moment when the underdog triumphs they reach for this song (which must make Gordy, Ashford, Simpson and their bankers very happy). When the song reaches ears voluntarily, however, it is still a delight. 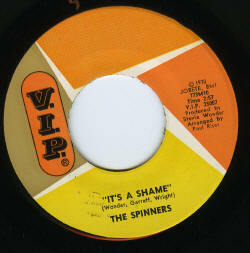 The Spinners had been absent from the charts for five years when “It’s A Shame” came out in June, 1970. In fact, the Detroit quintet had only two hits in their 10-year history up till that point. The group came to Motown when Berry Gordy hired Harvey Fuqua and bought his Tri-Phi label. Fuqua was an essential part of Motown’s artist development, nurturing a young Marvin Gaye and singing Tammi Terrell. By 1970, the Spinners were considered collateral damage from the Tri-Phi takeover, serving mostly as road managers and chaperones for more successful groups. Their hunger for a hit was a natural match for another Motown artist’s desire to spread his wings. When Gaye wanted to show his independence, he wrote and produced two hits for the Originals. Now Stevie Wonder looked at the Spinners and wanted to do the same. “It’s a Shame” was written and produced by the same team responsible for Wonder’s most recent hit “Signed, Sealed and Delivered.” Wonder’s musical and romantic relationship with Syreeta Wright continued to blossom and Lee Garrett once again contributed to the composition. The song opens with a hypnotic guitar hook, but it’s the Spinners’ harmony vocals that cement the number as a soul classic. The lyrics speak of heartbreak, but the delivery is effortless and graceful. The performance was so stellar that few artists have attempted to cover “It’s a Shame.” The song instead lives on as a sample, appearing in songs by R. Kelly, Sounds of Blackness, Lethal Bizzile and Monie Love. Once Marvin Gaye proved he could write and produce a hit song with “Baby I’m For Real,” he set out to show it wasn’t a fluke. 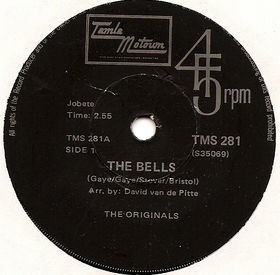 Released less than a year later, “The Bells” replicated the success of its predecessor, for both Gaye and the Originals. Like “Baby,” “The Bells” is a mid-tempo ballad that never picks up the pace past a pleasant trot. That said, whoever is playing the drums lays down some funky licks during the bridge (“I hear the bells/ringing in my ears”). The song closes with a spoken verse with smooth saxophone accompaniment, presaging the Quiet Storm movement. Although “The Bells” earned the Originals a gold record, the group had a hard time finding their previous success sans Gaye. Their next four singles failed to chart. It wasn’t until five long years later, in 1975, that their disco effort “Good Lovin’ is Just a Dime Away,” nibbled at the bottom of the charts. Their 1976 single “Down to Love Town” fared better, hitting No. 1 on the dance chart. 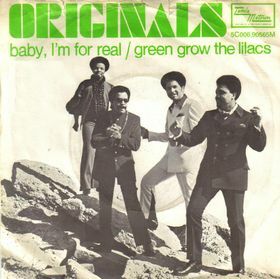 The Originals broke up in 1981 after the death of singer Ty Hunter. Twenty-five years later, founding member Hank Dixon toured with a reformed version of the Originals. Ironically, he was the only original member in the lineup. In 1971, Laura Nyro covered “The Bells” with Patti LaBelle contributing backing vocals. In 1994, New Jack Swing group Color Me Badd put the song back on the R&B charts. The Originals had appeared on nearly a dozen Motown hits before they finally landed one with their name on the label. As backing vocalists, the Detroit quartet saw their performances on “Function at the Junction,” “Twenty-Five Miles,” “For Once In My Life” and “My Whole World Ended (The Moment You Left Me)” – to name but a few – rise to the top of the chart. With its quivering strings, silky saxophone and smooth vocals, the song fit more into the Philly soul mold than the Motown model. Even the drums on the track are gentle and the performance floats by like a cloud across a lazy summer afternoon sky. Gaye’s intentions were not entirely altruistic. He wanted to spread his wings and used the song’s success to convince Gordy that he was capable of producing hit material. The triumph of “Baby I’m For Real” was quickly parlayed into the Originals’ follow-up hit, “The Bells” and helped paved the way for Gaye’s groundbreaking “What’s Going On” album. Nearly a generation after its original release, After 7 refurbished this classic and, blending it with Bloodstone’s “Natural High,” took it to No. 5 on the R&B chart. In 1972, soul singer Esther Phillps put her spin on the number. Faux-soulster Michael McDonald included his take on the more recent “Motown Two” album.